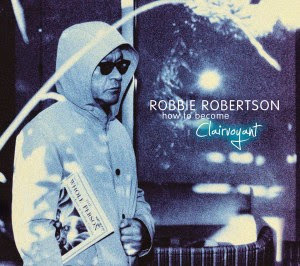 “Everything you leave behind catches up in another time,” sings Robbie Robertson in “This is Where I Get Off,” among the more provocative tracks on his stirring new album, How to Become Clairvoyant (429 Records). Indeed, the music legend recalls and comes to terms with his storied past—most notably chronicling the years just preceding and following his seminal tenure as guitarist and principal songwriter in The Band—on what is his fifth solo effort. Eric Clapton, with whom Robertson had years ago conceived much of the album’s musical foundation, appears in a number of instances, contributing vocals (as on the infectious duet, “Fear of Falling”) as well as acoustic and electric accompaniment. Further support is offered by the likes of Robert Randolph, who serves up a fiery pedal-steel solo on the rambunctious cut, “He Don't Live Here No More,” in addition to Tom Morello (guitar), Steve Winwood (organ), and Trent Reznor (sonic textures), each playing with discretion and deference to Robertson. Which is appropriate as the album is intensely personal often to the point of sounding confessional, its songs demonstrating Robertson at his most reflective and self-aware, to which the music in general complements with soulful, groove-rich subtleties. In fact, the arrangements alone are so moving that the entire work could have comprised instrumentals—two appear, in “Madame X,” penned by Clapton, and “Tango for Django,” both fascinating compositions—and still succeeded. That’s not to take away from the narratives, though, as Robertson delivers them like a seasoned storyteller. And while the circumstances he addresses will at times likely serve as a bone of contention for some—arguably none so much as on the aforementioned track, “This is Where I Get Off,” in which he lays out his reasons for breaking up The Band after The Last Waltz—but his rendering of them into the songs heard on How to Become Clairvoyant is as poignant and powerful as anything he has produced in his solo career.